Nothing can ruin the relationship between a human and a cat faster than the cat spraying. And it’s not just unneutered male cats who spray. Neutered males and spayed females do, too. But while a cat spraying is maddening and offensive to humans, it makes perfect sense to the cat. 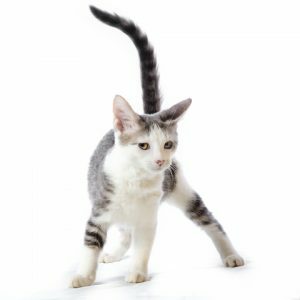 Cats spray to mark their territory, set boundaries and cope with stress. It’s a way of keeping other cats away from their personal space and reassuring themselves with their own scent. Is your cat spraying? Take a hard look at his lifestyle and try to figure out what’s causing so much stress he feels the need to spray. While you’re working on that, here are some ways to get him (or her) to stop. 1. Catnip: This is my favorite defense against a cat spraying. It’s a “friendly” scent and discourages urine marking. Sprinkle it on the floor where it meets the walls he’s spraying. Rub it on chair legs or upholstery if he sprays furniture. Refresh the catnip every day, or at least several times a week. 2. Feliway diffusers: These have never worked for me, but some people swear by them. Put one in every room where the cat’s spraying. 3. Bubble wrap: Put it on the floor against walls where he backs up to spray. He won’t like the sound of claws bursting bubbles and will stay away. You might have to secure the bubble wrap to the floor so he doesn’t push it aside to get to his favorite spot. 4. Double stick tape: This is something else to put against the walls. The cat won’t like the sticky feeling on his paws when he walks on it. 5. Desk chair pads: Put them one the floor, pointy side up. Walking on these things actually hurts! 6. Electronic deterrents: Some, like the ScatMat , create a tingling sensation when walked on. Others make a high-pitched noise that only a cat can hear. Both will make the areas where you put them off limits for spraying and just about everything else. 7. Relieve stress: This is the most important thing you can do if your cat’s spraying. How can you relieve your cat’s stress so he’ll stop spraying? Try these suggestions. – Get him outside. There’s no better stress reliever for cats than being outdoors. Think about taking him out on a harness and leash, providing some supervised outdoor time or building an outdoor enclosure or “catio.” If you live in an apartment, let him go out on the balcony. If you’re afraid he might jump or fall (he probably won’t), put wire mesh around the railings to make sure he’s safe. – In multicat families, create the illusion of more space by providing high places for perching and low places for hiding. Indoor cats are less stressed if they can carve out their own personal spaces. — Be relentless in discouraging outdoor cats from visiting your yard if you have strictly indoor cats. Your cats might start spraying to defend their territory from the invaders outside. – If all else fails, ask your vet for an anti-anxiety medication like Prozac. Personally, I’d rather tweak my cats’ environment than use drugs to make the one I’ve provided bearable for them, but Prozac is often a solution for a cat spraying. Never yell at your cat or hit him when you see him spraying. Punishment, including spraying him with a water bottle, will just confuse him and increase his stress. And that will make him spray even more. In his eyes, spraying is normal behavior, and your challenge is to relieve his stress so he doesn’t feel the need to spray.